Your very own 5 star resort. The lifestyle you deserve awaits you at this 5 bed 5 b property in villa park. Mostly rebuilt in 2006, this tuscan style home offers all of the bells and whistles for the astute buyer of today. 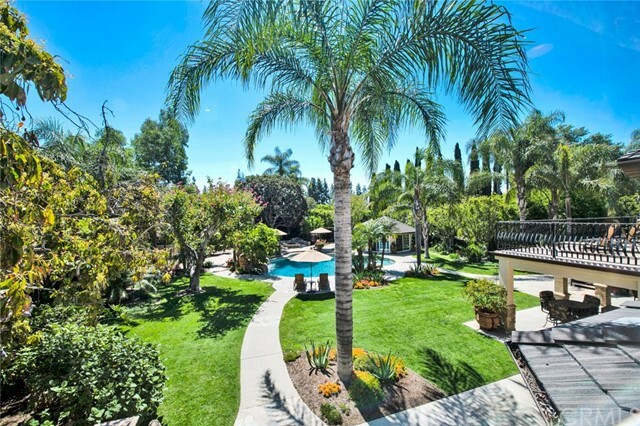 The incredible yard is an oasis that must be experiencedâ€”an entertainerâ€™s paradise including lush specimen palms, large covered patio, built in bbq with seating, plus surface burners and refrigerator, pool, spa and waterfalls, huge fire pit with seating, 440 sq. Ft. Octagonal pool house with Â¾ bath, plus swings and jungle gym. The interior is light and airy with a circular floorplan has abundant custom mullioned windows in every room offering a multi-functional floor plan. The chefâ€™s kitchen has stainless appliances, adjoins a breakfast nook and overlooks the incredible yard. Upstairs the elegant master suite offers a huge bedroom has two ceiling fans and french doors to a spacious balcony overlooking the yard, while the bath has double vanities and mirrors plus a dramatic shower and soaking spa tub. Huge walk in closet professionally organized with dressers, shelves and hanging space. In addition there are four other bedrooms two with walk-in closets. The laundry room, located upstairs for convenience has a utility sink plus folding counters. Dual heat and air, security and three car garage with gated vehicle access on the right. Visit this incredible property for yourself! For more information or make an appointment to see property ID PW19082614.